I see the problem ahh oblamer most Americans we neither slave nor slave owner. Nor are most Americans descendants of slaves or slave owners but you berrie are the descendent of slave owners from what your family tree shows and there is no other evidence of slavery in your family tree. That was tough, I had to go back three times to take all the salty language out of that. Knowing what I know about cuban race relations, I suspect that is the closest roul has ever been to a black male (ok half balck) other than shooting a few but don't expect berrie or our unbiased , fair and balanced media to mention that. I find it interesting that little brother Raul didn't want to be hugged by obola when in his long and sordid history he has touched and hugged much, much dirtier and despicable things and people ... if that's possible. Stilt, your commentary is spot on, but language matters. I bristle when I hear anyone say things like "ISIS took CREDIT" for the carnage. These cretins may have claimed responsibility for it, but there is no credit to be had for such subhuman barbarism. Just wait until he whose name shall not be spoken gives Che a posthumous Presidential Medal of Freedom. Then I will be really, really pissed. Nothing Øbitchboy does surprises me anymore. 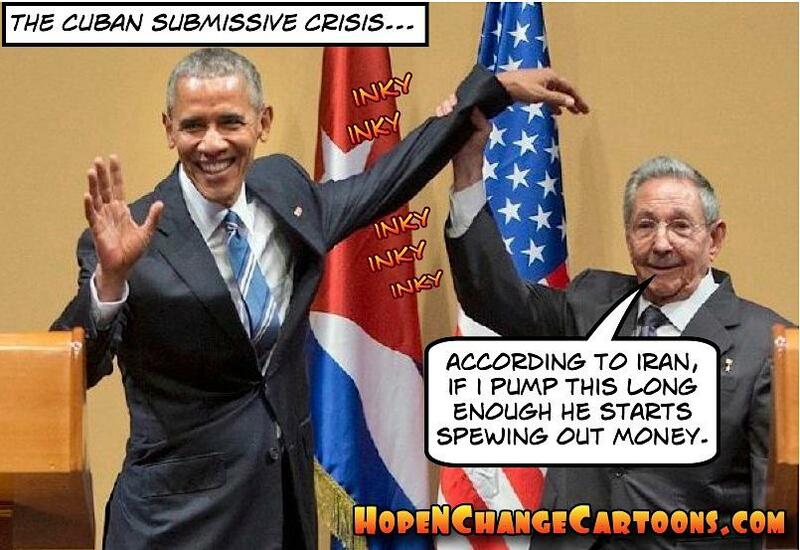 The limp-wristed photo op is disgraceful, but quite in character. So glad a little thing like an ISIS bombing didn't spoil Obummer's fun-filled vacation. @Joseph ET- The Internet had already been flooded with variations on this picture, but there was no way I was letting it go. It's just too stunningly awful not to be immortalized on these pages. @REM1875- Most filthy white Americans weren't slave owners back in the day. The greater likelihood is that they were impoverished farm workers, factory workers, or servants. But if Barry and his ilk are to continue promoting the idea of reparations from the white devils, they need to gloss over that inconvenient truth. @Fred Ciampi- In fairness, I wouldn't want Obama to touch ME either. @JGaultcsa- I couldn't agree more. In the original commentary I put quotes around "credit" but it broke the flow. I then tried changing the word to responsibility, but even that felt like it had too positive a connotation. I eventually used credit with no quotes - but not happily. @TrickyRicky- I don't know about the Medal of Freedom, but by posing for that picture Obama gave Che the Stamp of Approval - and it's disgusting. @Geoff King- Agreed. It's one thing to simply take an unfortunate photo, but in this case we have an accurate photo of an unfortunate president. @Anonymous- Unlike some, I don't think Barry had to drop everything and fly to Belgium. He DID, however, need to show an appropriate level of anger, gravitas, and sincerity about this attack on western civilization. I assure you that his few perfunctory words did nothing whatsoever to put the fear of God into Isis. The thing in OUR White House is a traitor plain and simple and should be dealt with as such!!!! I can see that if lamont was in the White House in the 80's his speech would include "Mr. Gorbachev, hand me a trowel!" Every time I think Obama can't possibly sink any lower he proves me wrong. I hope he enjoyed the ball game while they were still mopping up the blood in Brussels. Our president, caught fapping in front of a memorial to that bigoted murdered Che, went to a baseball game while carnage was mopped up in Brussels. I suspect our president felt a tinkle down his leg, as another commenter pointed out elsewhere. I am sure that Chris Matthews did. I expect Rrrrruule is doing the wrong kind of "pumping" with this asshat. Well, I'll be the contrarian today by stating that I didn't have a problem with Obama spending the afternoon with Raul at a baseball game. If he were here at home, he would have been golfing, so what's the big difference? The reality is that there really isn't much that Obama, or America can do for the Flemish, just as there was little we could do for France in the wake of the Paris bombings. Air Force One has excellent communications capabilities, and James Taylor is but a phone call away should Obama wish to deploy him to Brussels. As for his otherwise tepid response, I really don't understand why anyone should be surprised. To the Progressives, what happened in Brussels yesterday was simply "collateral damage" to be expected every so often as a cost to achieving their multicultural fantasies. The British bureaucracy used to call it "an acceptable level of carnage" in response to IRA terrorism a few decades ago. It's the price the elites are willing to have us pay in muggle blood in order not to have to do anything politically uncomfortable. Like most of Western Europe now, Belgium is now living the consequences of policy they've had in place for over a decade, where large communities of people who do not share western values have been established, and the relative comfort of low-responsibility living gives many plenty of free time to contemplate and execute mischief. The optics of addressing this in any meaningful way are seen as far worse than accepting the loss of a couple of dozen lives every so often. As for Obama's other comments, why should anyone be surprised. We've long known that he sees America as the bigger evil in the world. Maybe this loathsome cockroach could have visited the brave troops guarding his buddies in Gitmo instead of yukking it up and doing the wave at a baseball game sitting next to the murderous thug Castro. He did take time to denigrate Ted Cruz in a presser in Argentina for Ted's call for extra police scrutiny of Muslim enclaves in America. What the dumbass didn't know even as he was speaking, he presides over such a program in NYC with the help of the CIA. Commie DeBlasio also is apparently unaware of this as he joined the chorus of Cruz bashing. Trump is a buffoon but he would be infinitely better than this America-hating, dictator-loving scum. Ask me how I really feel! I barely skim the headlines anymore. I don't want to read the lies and misinformation being fed to the us by the Press. We don't get to know what the real truth is, only what the elite want us to think. Well, there is a day coming when it will all be over. God is still in charge and He told us it would get worse before it gets better. After seven years of infinitely worse, it will get better. Jesus will rule from Jerusalem with a rod of iron. Then all of this mess here will be gone and we will have peace. The Bible says it and I believe it. It doesn't bother me what anyone else thinks. I believe God's word is truth. I think that old video may still be out there; and this Cuba stuff reminds me of when Barry visited Russia, Moscow (before WH could intercept such media) showing where no Russians in the entourage would shake hands with him. His outreach and skills at being a puppet have improved. God, I'll be glad when this clown is out of office. If he'd eased off of Cuba slowly & quietly, without the big "see me" fan-fare; it would have been one of his very few actions with which I agree. It bothers me now there's nothing being said about a few precautions we should take. Most of the rest of the world has had access & trade there for a long time; but I don't see evidence of a lot of new money from them. I suppose we'll fill that gap. DONALD DRUMPF HAS ISSUED AN IMPORTANT, DEEPLY THOUGHT-OUT FOREIGN POLICY STATEMENT REGARDING ISIS!!!!!!!!!!!!! Just kidding - Garbage as usual from the Democratic moron posing as a Republican to get Hillary elected. The "awful legacy of the last eight years"? By all means. More Democrat governance please! Dividing America: If you followed the link for the last story, you might have noticed the panel in front of Bill with one of the Clinton campaign's themes, "Fighting for us". Exactly who is "us"? One of the most fascinating aspects of the Trump insurgency is how "multicultural" is it, and how little that fact is openly discussed for obvious reasons. If you look carefully, the average Trump rally is far more "diverse" than your average Hillary rally. They're absolutely more diverse that Bernie's lilly-white Vermont hippie following. As for Hillary's "us", I can only conclude that it means the usual Democrat constituency of the Federal bureaucracy, grievance groups and corporatist cronies. Bernie Sanders was a "conscientious objector" during the draft. We've never had a conscientious objector as Commander in Chief" before. Greedy Socialists: Notice that the Democrat candidates never talk about what they are going to demand of people, other than the "greedy rich". Bernie, who openly and frequently praises Scandinavian-style socialism never says "I'm going to tax 50% of your income just like they do in Scandinavia" to pay for all the "free" health care, college, and other stuff he's going to give everyone. He only talks about the "free". So tell me again just who it is in our society that is "greedy"? The people who are offended that half of their labors will be confiscated to be given to someone else, or those who wish that their health care, college and other stuff be paid for by someone else? Good points and bottom line is we will not be able to make sense of things when everything they say is just whoring for votes at that time, place or poll. The fact they don't ever TRY to cover some things is indeed very telling. Now I'm trying to imagine what Stilton will do the Tango photographs. I'm not in the same league with his wit and am looking forward to something, maybe? I about upchucked when I heard O'Liar on TV quacking that defeating ISIL was his number one priority. Really, Barry? Actions speak louder than words, you asshat! O'Liar has shown his priorities over and over during the past seven, miserable, BS filled years, and defeating our enemies is so low on the list, it doesn't even rank a spot above the footnotes. Amen brother! Some Bible scholars say the tribulation may occur after the Church is "raptured," but some say before. We best be prepared for the worst. Current events are chillingly close to Bible prophesy! I know folks have said this before over the years, but the parallels are escalating rapidly. With Iran so close to having nukes, Armageddon in Jerusalem seems almost a given, and within a very short timespan. My Swedish niece keeps Facebooking that Americans NEEEED to vote for Sanders because that is the way America NEEEEDS to go. I love my niece, but she is a prime example of a Swedish youth. Clueless on economics, 36 years old, never held a job for more than 6 months at a time, then a year or two off between to "rest." Thinks money comes from a government that has Kronors coming our their butts. 99% supported by the Swedes who are shelling out 50+ percent of their incomes, and still sponging off her now retired parents. And my dear brother sees nothing wrong with this. Sweden will be the next "Greece," and I fear also the next ISIS target. @Colby Muenster, if I was as selfish as you suggest your niece may be, I'd be voting early and often for Sanders too. We're middle-aged. We own our home free-and-clear, have no debt, and live relatively modestly. Our biggest single expense in life is health care. Shedding that single expense onto the shoulders of someone else much younger with little or no net worth who would be great for us; literally like a 5-figure raise. In fact, we could retire in our 50s just like many do in Europe with little change in lifestyle. In fact, we'd likely be better off. Little income means no income taxation. It's not the way I was wanting to spend the latter third of my life, but if that's what the socialists are going to force upon us, then that is what is going to happen. If socialism had a chance anywhere, it was Sweden or perhaps East Germany; a relatively small country that was already affluent and uni-cultural. And yet, the Sweden of today is not the same Sweden that my socialist friends waxed poetic about in the '70s and '80s. Over the last 20 years, Sweden has enacted reforms that Democrats here would never tolerate. (tax cuts, de-nationalization, austerity, easing of employment-for-life labor laws, school choice) Today, it's a country literally on the verge of a civil war over the immigration issue. Native Swedes are being told that they have to change to accommodate the newcomers. What was one of the safest countries in Europe is no longer so. Socialism is not compatible with mass immigration, especially from a diametrically opposed culture. Please ask your niece why it is that people in Sweden now have to buy private health insurance and care, especially if you are older and facing health issues other than that which can be addressed at a simple ER visit. I don't get it. Which is why I don't buy into the Sanders fantasy, because I know that it's just a short matter of time before in addition of paying my 50% in taxes for my "free" health care, that I'm also going to have to spend even more for private insurance and doctors just to survive. I spent a very pleasant several days/nights in Sweden on a big project about 12 years ago. I was in Gothenberg and several places to the north including large manufacturing and assembly plants. It's a nice place; pleasant people, organized & modern, very skilled, and it's true about all the blondes especially in a large and University city. We did not talk politics; it is socialistic with high taxes... but IMO with something different than where USA is even now: They do work. And they seem to have more respect for the right to speak (in civilized discussion) without interruption, science and engineering, meaningful skills and work, quality, and effective government. Since then the immigration issue has also surely changed things since I was there. @Readers- Well, shoot! I'd previously written a multi-part response here and it seems to have disappeared into the ether. And now I can't re-create it because I'm trying to limit use of my left hand (turns out my problem is a nerve running from my elbow to my hand which has been aggravated by - wait for it! - too much time at the computer). Anyway, fine stuff above. And hell YES I'm leading with the tango picture tomorrow. Ha! Nero fiddles while Rome burns, Obama Tangos as Europe bleeds!